A new formula gauges a person’s 10-year risk of dying by estimating a person’s ability to exercise on a treadmill at an increasing speed and incline. Analyzing data from 58,000 heart stress tests, Johns Hopkins cardiologists report they have developed a formula that estimates one’s risk of dying over a decade based on a person’s ability to exercise on a treadmill at an increasing speed and incline. Several exercise-based risk scoring systems already in use are designed to measure short-term risk of dying but do so strictly among patients with established heart disease or overt signs of cardiovascular trouble. Such scores factor in multiple variables and incorporate results from additional tests, including electrocardiograms (EKGs). 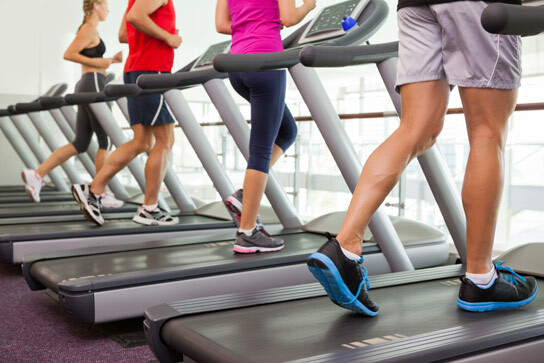 By contrast, the new algorithm, dubbed the FIT Treadmill Score and described in the March 2 issue of the journal Mayo Clinic Proceedings, can gauge long-term death risk in anyone based solely on treadmill exercise performance. The score, the research team says, could yield valuable clues about a person’s health and should be calculated for the millions of patients who undergo cardiac stress testing in the United States each year. “The notion that being in good physical shape portends lower death risk is by no means new, but we wanted to quantify that risk precisely by age, gender and fitness level, and do so with an elegantly simple equation that requires no additional fancy testing beyond the standard stress test,” says lead investigator Haitham Ahmed, M.D. M.P.H., a cardiology fellow at the Johns Hopkins University School of Medicine. In addition to age and gender, the formula factors in peak heart rate reached during intense exercise and the ability to tolerate physical exertion as measured by so-called metabolic equivalents, or METs, a gauge of how much energy the body expends during exercise. More vigorous activities require higher energy output (higher METs), better exercise tolerance and higher fitness level. An activity such as slow walking equals two METs, compared with eight for running. Exercise stress tests — commonly used to determine who needs invasive cardiac testing and inform treatment decisions — measure how well the heart and lungs respond to physical exertion while a person is walking on a treadmill at progressively higher speed and elevation. The test is stopped once a person reaches the point of exhaustion or develops chest pain, dizziness or heart rhythm abnormalities. Those who have abnormal findings on their EKG tracings during exercise or who develop symptoms suggestive of abnormal heart strain during the test are referred for angiography, an invasive procedure to examine the interior of the heart’s main blood vessels. Those who have normal EKG readings and no alarming symptoms while exercising are said to have “normal” results and typically do not require further testing. However, the researchers say, the new data show varying degrees of fitness among those with “normal” stress test results that reveal telling clues about cardiac and respiratory fitness and, therefore, overall death risk over time. For the study, the team analyzed information on 58,020 people, ages 18 to 96, from Detroit, Michigan, who underwent standard exercise stress tests between 1991 and 2009 for evaluation of chest pain, shortness of breath, fainting or dizziness. The researchers then tracked how many of the participants within each fitness level died from any cause over the next decade. The results reveal that among people of the same age and gender, fitness level as measured by METs and peak heart rate reached during exercise were the greatest indicators of death risk. Fitness level was the single most powerful predictor of death and survival, even after researchers accounted for other important variables such as diabetes and family history of premature death — a finding that underscores the profound importance of heart and lung fitness, the investigators say. Scores ranged from negative 200 to positive 200, with those above 0 having lower mortality risk and those in the negative range facing highest risk of dying. Patients who scored 100 or higher had a 2 percent risk of dying over the next 10 years, while those with scores between 0 and 100 faced a 3 percent death risk over the next decade. In other words, two of 100 people of the same age and gender with a score of 100 or higher would die over the next decade, compared with three out of 100 for those with a fitness score between 0 and 100. People with scores between negative 100 and 0 had an 11 percent risk of dying in the next 10 years, while those with scores lower than negative 100 had a 38 percent risk of dying. Published along with the study is a chart depicting death risk by age, gender and fitness level, which can be printed on placards for use in physician’s offices to guide clinical advice. For example, a 45-year-old woman with a fitness score in the bottom fifth percentile is estimated to have a 38 percent risk of dying over the next decade, compared with 2 percent for a 45-year-old woman with a top fitness score. “We hope that illustrating risk that way could become a catalyst for patients to increase exercise and improve cardiovascular fitness,” Blaha says. Other Johns Hopkins investigators involved in the research included John McEvoy, Roger Blumenthal and Steven Jones. Researchers from other institutions included Mouaz Al-Mallah, Clinton Brawner and Steven Keteyian of Henry Ford Hospital in Detroit and Khurram Nasir of Baptist Health Medical Group in Miami Beach, Florida. 1 Comment on "FIT Treadmill Score Gauges Risk of Dying Based on Treadmill Exercise Performance"
This appears to be a very interesting study BUT it is fairly useless as you can’t access the actual test data in order to utilize it. I can’t access the publication in which it was written.